ARP Haruna — Japanese Tier V battleship. A Battleship of the "Fleet of Fog". Modeled after the Imperial Japanese Navy's 3rd Kongo-class battleship, Haruna. First seen engaging I-401 in combat alongside Kirishima, she was defeated by the superior tactics of Gunzo Chihaya, commander of I-401. Her Mental Model "Haruna" always wears a large overcoat and has a keen interest in the human language, "collecting" word samples as she hears them. This warship has been specially designed for World of Warships, and is modeled after Haruna as she appears in "ARPEGGIO OF BLUE STEEL -ARS NOVA-". ARP Haruna comes fully upgraded, with the same upgrade slots found on Kongo and a captain with free Commander Skill points (the number of which depends on event and region). As this is an ARP ship, ARP Haruna cannot mount camouflage. Haruna as she appears in Ars Nova. Haruna’s mental model, and captain in the game. Haruna with her specifications in Ars Nova. Haruna as she appears in the game. Haruna (kanji: 榛名, katakana: ハルナ) Fast battleship of the Second Oriental Fleet. Later, guardian of Makie Osakabe and member of Blue Steel. In 2038, a mysterious fleet of warships, who have lurked around the world in the decades decades before, goes on the offensive against humanity. Modeled after ships that appeared in World War II, but possessing weaponry far superior to those in humanity's possession and protected by an indestructible barrier immune to whatever we have to throw at them, humanity quickly loses control of the seas and our military forces are annihilated in the desperate battles against them. The result was a world where humanity's presence in the oceans was no more, with communication via the seas cut off and humans isolated from each other, blockaded by the "Fleet of Fog". Haruna is a Fog battleship whose Mental Model takes the form of a teenage girl wearing a heavy coat that covers all of her body up to the nose. She works in tandem with Kirishima, and was originally ordered to attack Yokosuka in order to destroy I-401 and Blue Steel. Haruna showed a special interest in humans and their language. She began storing their phrases, especially concerning death. The two Kongo sisters were defeated, and she along with Kirishima were ejected from their ships and found themselves alive on some random beach. A girl named Makie happened upon them, and eventually befriends them. Haruna notices something very special about this girl, and decides she needs to follow her. Eventually, she decides to protect Makie, even if this means going against the Fog. Both Haruna and Kirishima not only betray the Fog but also join the Blue Steel fleet. The two pool their resources to help the I-401 and her crew in their final engagement against Kongo. In the Cadenza film, Hyuuga restores her vessel and comes to assist I-401 in their battle with the Student Council Fleet, engaging Haguro to allow I-401 to escape and confront Musashi. 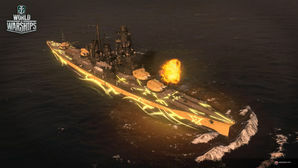 The model of Kongo in the game has superstructure based on the one given to Hiei for her modernization, which differs significantly from her sisters. This superstructure served as the prototype of the bridges that were eventually fitted onto Yamato and Musashi. The game model of Haruna is a re-skin of the regular Kongo, which is based on Hiei, and therefore retains this inaccuracy. Also, while the in game models of the ARP ships depict them with planes textured in the style of their mother ship, the ships of the Fleet of Fog, even those which are modeled after ships that carried and launched aircraft, do not carry planes. Haruna (榛名, named for Mount Haruna, a volcano in Gunma Prefecture), was a warship of the Imperial Japanese Navy during World War I and World War II. Designed by the British naval engineer George Thurston, she was the fourth and last battlecruiser of the Kongo class, amongst the most heavily armed ships in any navy when built. Laid down in 1912 at the Kawasaki Shipyards in Kobe, Haruna was formally commissioned in 1915 on the same day as her sister ship, Kirishima. Haruna patrolled off the Chinese coast during World War I. During gunnery drills in 1920, an explosion destroyed one of her guns, damaged the gun turret, and killed seven men. During her life, Haruna underwent two major reconstructions. Beginning in 1926, the Imperial Japanese Navy rebuilt her as a battleship, strengthening her armor and improving her speed and power capabilities. In 1933, her superstructure was completely rebuilt, her speed was increased, and she was equipped with launch catapults for floatplanes. Now fast enough to accompany Japan's growing carrier fleet, Haruna was reclassified as a fast battleship. During the Second Sino-Japanese War, Haruna transported Imperial Japanese Army troops to mainland China before being redeployed to the Third Battleship Division in 1941. On the eve of the Japanese attack on Pearl Harbor, she sailed as part of the Southern Force in preparation for the Battle of Singapore. Haruna’​s fitting-out at Kobe in October 1914. A 14-inch gun being installed aboard Haruna, October 1914. Haruna at Kōbe on 24 April 1915. Haruna at Yokosuka, 11 September 1916. Haruna undergoing trials after her reconstruction in 1928. Haruna in 1934, following her second reconstruction. Haruna at Yokosuka in 1935. Yamashiro, Fuso and the fast battleship Haruna in the late 1930s. Haruna at her moorings near Kure, Japan, under attack by U.S. Navy carrier aircraft, 28 July 1945. Haruna, sunken at her moorings after the attack of 28 July 1945. A drawing from the U.S. Office of Naval Intelligence depicting the Kongo-class in 1944–1945.